The final table bubble was grueling but the opposite could be said about the actual final table. Daniel Pidun destroyed his opponents and took home the Season 9 EPT Berlin title after just six hours of play. There were not many big blinds in play during the final table and Pidun utilized his stack to the fullest after picking up a bunch of chips at the start. Eventually nobody could stop the German who finished ninth in this event two years ago and 17th last year. Pascal Vos was the first player at the final table to double up. Vos ended up all in with jacks against Roman Korenev's ace-queen suited and a flopped set kept him alive. Korenev was knocked down to being the shortest stack and not too long after this he was eliminated. Korenev was in great shape to double up with jacks versus Alexander Helbig's pocket fours. The board brought four spades and Helbig happened to have one of those as he knocked out the Russian player. Korenev took home €77,000 for his eight place finish. Seven-handed play lasted for quite some time as everyone was very much aware of the ICM implications. Julian Thomas, a Sit and Go specialist, was the unfortunate number seven and he took home €110,000. Roman Herold moved all in from the button and Thomas was looking to isolate by reshoving from the small blind. Robert Haigh woke up with ace-queen suited in the big blind and he called to put two players at risk. Herold tripled up with pocket kings and Thomas was knocked out with ace-five. In the level where EPT Deauville, with a similar field, ended it was still six-handed in Berlin. The level had just begun when Herold was all in for his tournament life with ace-jack of hearts. Herold had plenty of outs against Alexander Helbig's pocket treys but did not catch up. 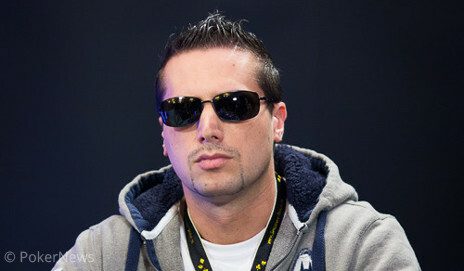 Herold took home €155,000 for his sixth place finish. Herold's knockout gave Helbig some chips but it wasn't enough. Helbig reshoved just a few hands later and ran his pocket fives into Pidun's eights. No luck for Helbig who was knocked out in fifth place for €202,200. In Season 1 there were two Dutch EPT winners with Rob Hollink and Noah Boeken, in Season 5 Constant Rijkenberg and Pieter de Korver won and on the last stop this season it was Ruben Visser who took down EPT London. Vos was aiming to add his name to this list but he was knocked out in fourth place. Vos ended up all in with ace-seven versus Pidun's ace-queen and did not catch a lucky break. With just three players remaining Pidun had amassed a huge chip lead over his two opponents. 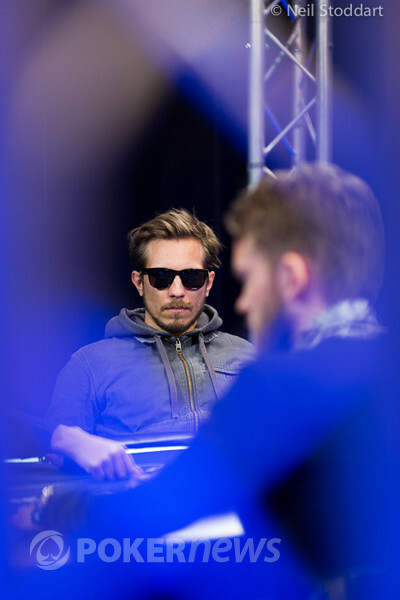 Right after Lasse Frost doubled up to eight big blinds he decided to move all in and both his opponents made the call. This pot turned into the most interesting up until that point as a huge side pot between Haigh and Pidun was created post-flop. Pidun ended up leading the river for 2,000,000 chips but Haigh decided to give it up. Pidun showed that he had made the runner-runner nut flush and he started heads up play with 24,500,000 to Haigh's 2,800,000. 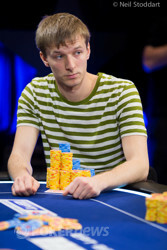 Lasse Frost was knocked out in third place and he took home €325,000. Haigh doubled up once but it wasn't nearly enough to get a chance to compete with Pidun's huge stack. On the final hand Pidun shoved all in with nine-eight of spades and Haigh snap-called with ace-king. The flop gave Pidun a pair of eights and Haigh did not managed to catch up. Haigh walked away with €531,000 for his second place finish while Pidun was crowned the Season 9 EPT Berlin winner and took home the €880,000 first-place prize. From the Germany capital and the heart of Europe we would like to thank you for following our EPT Berlin coverage all throughout the week. Make sure to tune back in to PokerNews.com on May 6th as the coverage of the EPT Grand Final kicks off with the €10,000 Main Event! Daniel Pidun moved all in from the button and Robert Haigh snap-called from the big blind for around 3,000,000 chips. The board ran out and Haigh was knocked out! Haigh takes home a hefty €531,000 second place prize but Pidun walks away with the amazing €880,000 for the win. Robert Haigh moved in his six big blinds from the button and Daniel Pidun called. The board ran to give Haigh two pair. Robert Haigh: EPT9 Player of the Year? Robert Haigh is heads-up for the title in EPT Berlin but is also challenging for the EPT9 Player of the Year title. Can the German catch up with side event wizard Jan Bendik? Read more at the PokerStars Blog. Robert Haigh raised to 400,000 from the button and Daniel Pidun called from the big blind. The flop brought the and Pidun checked to Haigh who bet 400,000. Pidun moved all in and Haigh folded his cards. Cards are back in the air. Can Robert Haigh mount a miraculous comeback? The players are a short break before heads up play commences.